The idea came from a free Amuse Bouche offered by Panzano, the restaurant inside the Kimpton Hotel Group offering in Denver, the Hotel Monaco, at the 5:00 p.m. lobby happy hour. 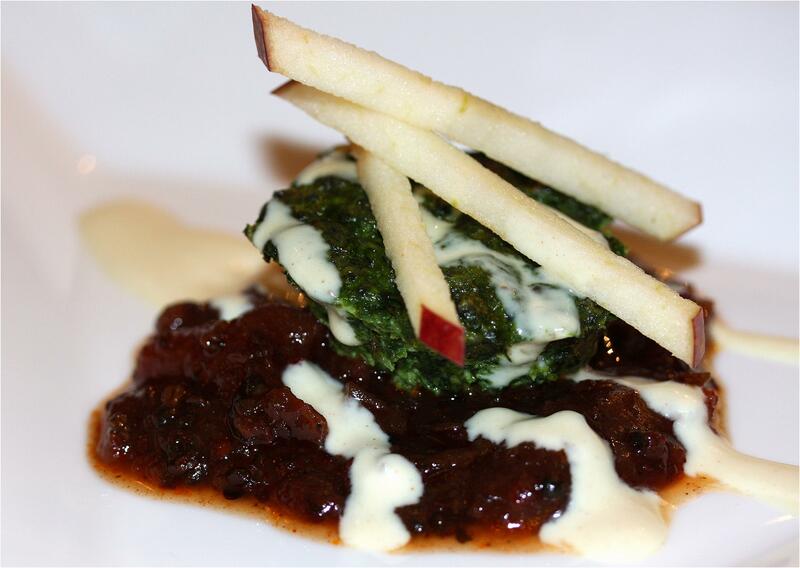 It turned into a high end vegetarian dish: Spinach and Cheese Gateaux with Tomato Chutney, Apple and Dijon Creme Fraiche. Prepare the Spinach and Cheese Gateaux. Preheat oven to 400° Fahrenheit. Pulse the spinach in three batches in the bowl of a food processor fitted with an “S” blad until finely chopped. Transfer to a medium bowl, add the ricotta, parmesan, eggs, garlic, salt and pepper and stir to thoroughly combine. Cook the Chutney. Place the tomatoes, ginger, onion, minced garlic (not the whole garlic cloves), turmeric and cayenne in a bowl and mix thoroughly. Heat the oil in a heavy sauce pan over medium heat. Add the garlic cloves, stir and fry until lightly brown. Add the cumin, mustard, and fenugreek and allow to sizzle for about five seconds before adding the red peppers. They should puff up and darken. Add the tomato mixture (it will splatter when it hits the hot oil). Add the brown sugar and apple cider vinegar. Stir and cook on medium heat for 15 minutes, or until the liquid is reduced. This recipe should yield about 1 cup of chutney. Cook the Spinach and Cheese Gateaux. Coat 8 cups of the muffin pan with brushed olive oil. Divide the spinach mixture among the 8 cups (they will be very full). Bake the spinach cakes until set, about 20 minutes. Let stand in the pan for 5 minutes. Loosen the edges with a knife and turn out onto a clean cutting board or large plate. Make the Mustard Creme Fraiche. Place the Creme Fraiche and mustard in a mixing bowl and whisk to combine. Add the rice wine vinegar and mix well. Pour the Mustard Creme Fraiche into a squeeze bottle. Plate the Dish. Spread a circle of the Spicy Tomato Chutney in the center of each plate, about a ¼ inch wider than the widest dimension of the Spinach and Cheese Gateaux. Place a single Spinach and Cheese Gateaux on top of the Chutney. Line the outer ring of the chutney with the Mustard Crème Fraiche and place a dollop of it on top of the Spinach and Cheese Gateaux. Arrange the julienned apple on top of the Gateaux. Garnish with finishing salt.